AS A COOKBOOK AUTHOR, artist, and baking teacher working all across the United States, I always yearned for a single cookbook that could give me the right recipe, from the seashore to the ski slope. But an all-altitude book didn’t exist. My cakes too often fell, my soufflés slumped, my muffins were miserable. Out of frustration some years back, I finally decided to take about 100 of my favorite sea-level recipes and adjust them for altitude. As I eyed my previously published traditional cookbooks, I knew that I faced ever more serious challenges. Research shows that folks are living (and cooking and baking) at near or above 3,000 feet of elevation in 34 of the 50 states. It is no accident that many of the world’s flatbreads, such as tortillas and naan, were developed in high, thin-air elevations where it is difficult to get doughs and batters to rise. Just take your grandma’s devil’s food cake recipe to a Taos ski chalet and you will see what I mean. At altitude, cakes can rise surprisingly high in the oven, then collapse on the counter. What’s going on? I had to figure it out. My dream was to work in a Santa Fe kitchen. With family and friends there, I had often been a visitor. I was entranced by the town itself, and blithely assumed that the recipes I had so carefully developed in my Connecticut kitchen (elevation 540 feet) would, if slightly tweaked, behave in 7,000-foot Santa Fe. I knew the basic high-altitude guidelines, and I counted on them. One of my earliest attempts to solve the baking-at-altitude puzzle had actually begun earlier, when a Santa Fe cookware shop invited me to teach a children’s Easter baking class. To ensure my recipes would work, I traveled to Santa Fe on a recipe-testing mission—cake pans, pie plates, oven thermometer, dashboard altimeter, even potholders on board. I began by whipping up a chocolate buttermilk cake, one of my most reliable recipes, adding a few altitude adjustments from an all-purpose bakers’ bookmark. My two layers rose dramatically in the hot oven, but crashed as they cooled. While guests sat expectantly in the dining room, I frantically stuck the layers together, slathered them with whipped cream, and called it pudding cake. From that point on, I experimented systematically, making a serious study of the high-altitude baking phenomenon. My first big success was that Easter class. After many trials, the recipes worked, the cakes rose, and I was hooked. A few months later, I came back to New Mexico, borrowing a friend’s kitchen to develop a new group of recipes for use in Santa Fe’s rarefied air. Once I felt that I was on the right track, I proposed a second class, billed in a Santa Fe New Mexican article as an interactive, problem-solving high-altitude baking workshop. To my surprise, the response was overwhelming. Longtime New Mexicans and sea-level transplants crowded into the kitchen. All had nearly given up on baking at home. Some said they had loved baking before moving west, had always made their families’ birthday cakes, and felt that baking desserts with their own hands made celebrations more festive. They missed the praise and the pride in presenting a party’s grand finale. When they saw the results of our class demonstration, they couldn’t wait to try the recipes at home. We discussed the fact that boxed mixes were not a solution because their altitude instructions often failed and certainly didn’t consider the highest elevations. We compared my new recipes with the participants’ old ones, learning how to “altitude” (a new verb) the sea-level formulas in conventional cookbooks. They volunteered to help test, if I would take on the challenge and write a book of reliable altitude recipes. That was my “a-ha” moment. When I got home, I picked up the phone and called my former cookbook editor and her husband at their Santa Fe house. Enthusiastic bakers and foodies, they were thrilled with the idea. Also, luckily, they were about to leave for a long trip. “Come bake in our kitchen,” they generously offered. “Stay for opera season and Indian Market, and by the way, would you mind cat-sitting?” I was in heaven. Their sunny kitchen—well organized, spacious, and designed for two people who loved to cook together—was perfect for testing. I couldn’t wait to get started. Soon, though, I was near burnout. I decided it was time for another set of hands and a few laughs, so I called my chef friend Stacy Pearl (who’s since relocated to New York). Patient, analytical, and very good-humored, she offered to help me “altitude“ my sea-level recipes for use at 7,000 feet, one ingredient at a time. Together, we adjusted, re-baked, re-timed, re-calibrated, and re-tasted. We took a couple of bites, snapped photographs, compared samples, and froze leftovers. What were we looking for? A well-risen, sea-level-like product, no also-rans or near misses, nothing too dense, too dry, too moist, or lopsided. Our original goal was to find a quick fix, an easy adjustment of ingredients that would work in all cases. Our biggest surprise: There was no one-size-fits-all solution. Every recipe was unique, with success achieved by varying the formula by as little as a teaspoon more flour or a tablespoon more liquid, or using a slightly higher temperature or a longer baking time. Since then, I can confidently conclude that home baking is alive and well, no matter the altitude. The continued popularity of my 2005 book Pie in the Sky confirms that this subject is important, the material needed. On my website, I get questions daily from people from as far away as the Andes Mountains. Here’s good news: If you live in the high country and your baking doesn’t turn out as you hoped, you can blame it on the altitude. I urge you to bake, though, wherever you live. Baking is a way to share abundance, to be creative, to nourish families, to enrich friendships, and—absolutely—to romance the one you love. Connecticut resident Susan G. Purdy teaches cooking classes throughout the United States, most recently at the Santa Fe School of Cooking. Learn more at highaltitudebaking.com. Susan G. Purdy offered a few of her favorite recipes to give a homemade Valentine’s Day dinner an unforgettable finish. We’ve included her tips for adjusting the recipes for different altitudes. The best sources, though, are her books, especially Pie in the Sky, which includes cakes, pies, cookies, breads, and pastries that work from sea level to 10,000 feet in elevation. These recipes go to 7,000 feet. This old-fashioned, moist chocolate cake has a fine grain and tender crumb. It is sensational at sea level and made-to-order for high elevations because it contains buttermilk, a favorite high-altitude ingredient that contributes moisture and tenderness as well as extra acidity to help the batter set quickly. For Valentine’s Day, bake it in heart-shaped metal cake pans (see recipe instructions). Fill the layers with your favorite raspberry jam and frost with Bittersweet Chocolate Icing. This recipe is written for sea level, with altitude adjustments in parentheses. Optional: Decorate with chocolate roses. For recipe, go to nmmag.us/SusanPurdy. Created for baking at about 7,000 feet in Santa Fe (with altitude adjustments in parentheses), this recipe contains a triple bite: powdered ginger, grated fresh gingerroot, and pepper; add more or less spice to suit your taste. Without the icing, you can dust the cupcakes with sifted confectioners’ sugar; with icing, top with slivered candied ginger. This recipe is a dinner-party winner and bake-sale or picnic favorite. Position a rack in center of the oven and preheat to 350°. Line cupcake/muffin pans with paper liners or generously grease and flour the pans. Grate gingerroot and set aside. Combine the molasses and hot water in a 2-cup measure and stir until dissolved. In the large bowl of an electric mixer, cream together butter and sugar until very well blended. Scrape down bowl and beater. Beat in eggs, sour cream, and grated gingerroot. Scrape down bowl again. With mixer on lowest speed, alternately add the flour mixture and the molasses liquid. Scrape bowl, beat a few seconds longer. Batter will be soft. Spoon batter into prepared cups; fill about full and bake for about 20–24 minutes or until tops of cupcakes are well risen and a cake tester or toothpick in the center comes out dry. (Time varies depending on cup size and elevation.) Cool pans on wire rack. Store completely cooled cupcakes in airtight containers. Let cool completely before adding icing or peeling off paper liners—warm cakes are fragile. Garnish icing with slivered or chopped candied ginger. 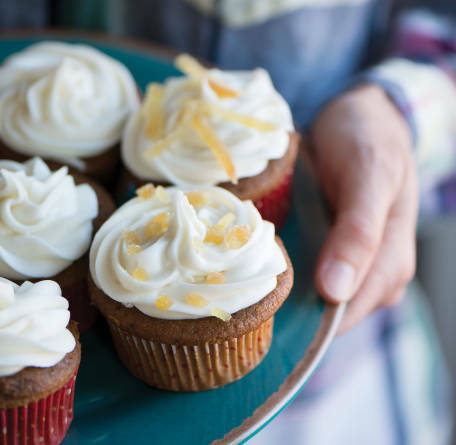 Makes 1 generous cup—enough for larger cupcakes; double recipe for mini-cupcakes. In food processor, blend cream cheese and butter, add sugar, and pulse. Add remaining ingredients and pulse until thick and smooth. Add more sugar or rum/lemon to adjust texture and taste if needed. Icing thickens when refrigerated. Pipe onto cupcakes through a decorating tube fitted with star tip or spread with knife. Read recipes carefully; don’t substitute essential ingredients—“spreads” for butter, for example. • Use the recommended pan sizes and prepare pans as directed so baked goods do not stick or overflow. Bring all ingredients to room temperature before blending. Keep an auxiliary thermometer (inexpensive, sold in hardware stores) inside your oven chamber for accuracy; most ovens are inaccurate. Small adjustments make a big difference: A little more liquid improves a batter or pie dough in dry air. • Since less air pressure at altitude makes baked goods rise easily, reduce leavening agents slightly, allowing nature to do some of the work. • To keep items up once risen, strengthen protein content: an extra egg, more flour, or less sugar. Flavors can be bland in high, dry air. Add just a little more extract, citrus zest, or a pinch of salt. • Water boils at lower temperatures as you go higher (1.9° cooler per 1,000 feet of elevation). Use recipes specifically developed for your altitude.